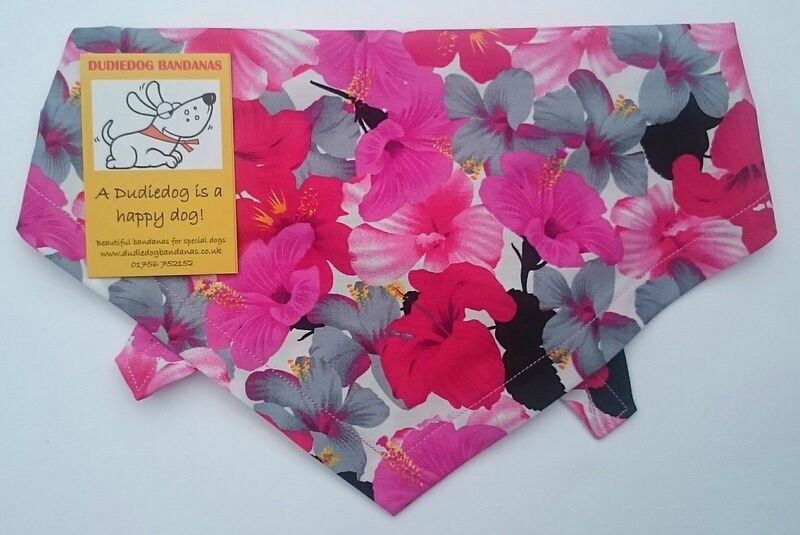 A gorgeous 100% cotton Pink Hawaiian Floral dog bandana in summery shades of pink. This is a really cute design... the perfect pet accessory for the summer holidays, and days out at the beach. But like all Dudiedog bandanas, you can wear it anywhere! Wear it when the sun shines, or when it's raining to cheer everyone up! "Absolutely love these bandanas and the amazing customer service. Items are made to a really high standard, the delivery is always very quick and the personalised notes are really cute. The Dudiedog community is something very special and its really nice seeing everyone's pooches in their kit. Jan and family have a fantastic brand here and deserve to do as well as they are."